Egypt and Art > Tour Map of Egypt > Tour Esna Directory > Old buildings in the Modern Town. Old buildings in the Modern Town. 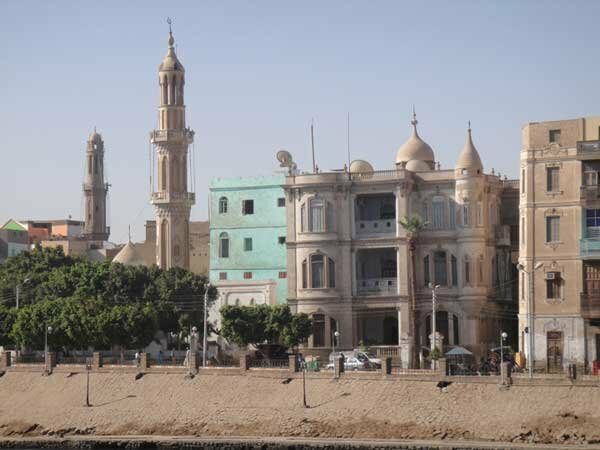 A Panoramic View of Aswan. An Ancient Obelisk in the Modern City. An Archaeological Dig on the West Bank. Moon Over the Aga Kahn. Shopping Market in Modern Cairo. Sky Scrapers of Modern Cairo. The Tomb of Anwar Sadat. Sailing a Felucca on the Nile. A Replica of a Shrine Boat. A View of the Desert. Approaching the Temple of Hathor at Dendera. Approaching the Temple of Edfu. Building the Temple of Edfu. Entering the Temple of Edfu. The Battle of Horus and Seth. The Pronaos at Edfu Temple. Approaching the Temple of Esna. Inside the Temple of Esan. Modern Street Level vs. Ancient Street Level. Painted Columns in the Temple of Esna. Sailing into the Town of Esna. A Sphinx at Luxor Temple. A Panoramic View Overlooking Saqqara. Oops… Wrong King, Different Memphis. Approaching The Island of Philae. The First Pylon at Philae. The Sunken Island of Philae. The Valley of the Kings.